The user’s body grows all at once, raising the Attack and Sp. Atk stats. A sweet scent that harshly lowers opposing Pokémon’s evasiveness. This also lures wild Pokémon if used in places such as tall grass. The user draws power to attack by using its held Berry. The Berry determines the move’s type and power. A seed that causes worry is planted on the target. It prevents sleep by making the target’s Ability Insomnia. The user releases a soothing scent that heals all status conditions affecting the user’s party. The user faints. In return, the Pokémon taking its place will have its HP restored and status conditions cured. The user emits a shock wave from its body to attack its target. This may also harshly lower the target’s Sp. Def. The target is attacked with a powerful beam. The user can’t move on the next turn. A two-turn attack. The user gathers light, then blasts a bundled beam on the next turn. The target is hit by a strong telekinetic force. This may also lower the target’s Sp. Def stat. The user goes to sleep for two turns. This fully restores the user’s HP and heals any status conditions. The user draws power from nature and fires it at the target. This may also lower the target’s Sp. Def. The user charges at the target using every bit of its power. The user can’t move on the next turn. The user flashes a bright light that cuts the target’s accuracy. It can also be used to illuminate dark caves. A frenetic dance to uplift the fighting spirit. This sharply raises the user’s Attack stat. The user snares the target with grass and trips it. The heavier the target, the greater the move’s power. The user enrages and confuses the target. However, this also sharply raises the target’s Attack stat. The user makes a copy of itself using some of its HP. The copy serves as the user’s decoy. An attack whose additional effects depend upon where it was used. Can also be used to make a Secret Base. An attack that makes use of nature’s power. Its effects vary depending on the user’s environment. The user tells the target a secret, and the target loses its ability to concentrate. This lowers the target’s Sp. Atk stat. A nutrient-draining attack. The user’s HP is restored by half the damage taken by the target. An attack move that cuts down the target’s HP to equal the user’s HP. The user endearingly approaches the target, then steals the target’s held item. The user makes the ground under the target erupt with power. This may also lower the target’s Sp. Def. The user hurls mud in the target’s face to inflict damage and lower its accuracy. 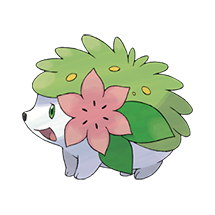 What do think about Shaymin? Please log in to rate this pokemon.